My friend and book pen pal (where we send each other more books than letters) Christine sent me this book last year and it’d been on my to read shelf forever, it seemed, even though I’d read Americanah by the same author almost as soon as Christine sent me that. I guess I got caught up in other books, but finally took this one on vacation this week. I’m so glad I finally read it. 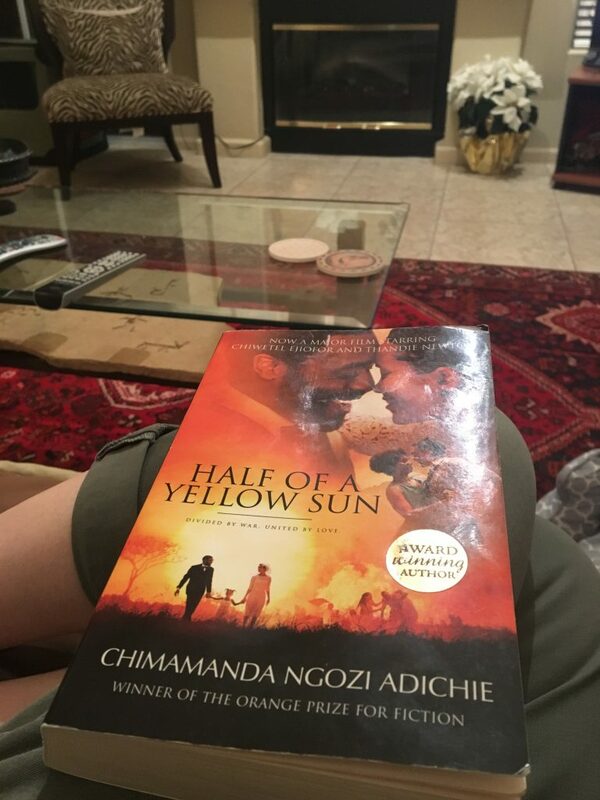 Half a Yellow Sun is by far one of my favorite novels now. It starts out with a teenage houseboy narrating his story of working for a revolutionary academic in early 1960s Nigeria. The story is also narrated by the wife of the academic and her twin sister’s white British boyfriend. I don’t want to give away too much of the story, but the narrators take the reader through the civil war in the late 60s when a part of Nigeria breaks away and forms Biafra. There was no way the world superpowers were going to stand for that. Biafra and some of the characters in the book never had a chance. I read in a Goodreads review that this story is so riveting that it’s easy to overlook Chimamanda Ngozi Adichie’s beautiful writing. I think that sums it up perfectly. I got so caught up in the story and the characters that it wasn’t until after I’d finished the book that I stopped and thought about how flawless a writer she is. And now that’s all I think about.